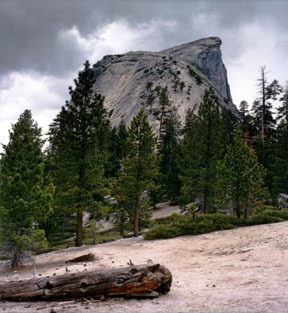 Fine Art Photography along the Trail to the Summit of Half Dome in Yosemite National Park, California. 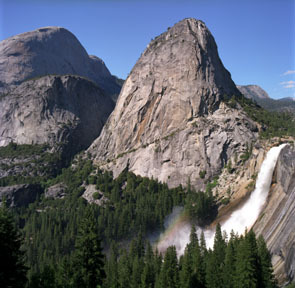 Half Dome rises to an elevation of 8,842 Feet (2,720 meters). That's about 4,700 feet (about 1,430 meters) above the Yosemite Valley floor. 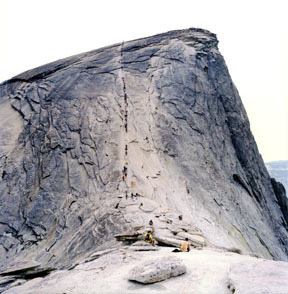 This page follows the trail to Half Dome, starting from the Happy Isles area at an elevation of 4,035 feet (1,230 meters), over the course of about 12 hours on one-day hikes on June 1, 2002, and again on May 31, 2003. The images below are in ascending order, rather than chronological order, up the trail to the summit. On these trips, we took the Mist Trail up (7.0 miles/11.3 Km to the summit) and the John Muir Trail on the way down (8.2 miles/13.2 Km back to Happy Isles). 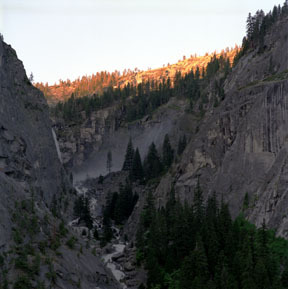 Illilouette Falls is the first falls encountered, seen to the south-southwest before the Vernal Falls Bridge crossing. It has a drop of 370 feet (113 meters) over sheer granite faces. The time was just before 6 AM, and this was the first sunlit terrain we saw that day. After a moderate hike of 0.8 miles (1.3 Km) from the trailhead, the trail crosses over a roaring Merced River via the Vernal Falls Bridge. 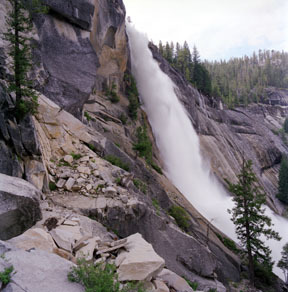 Vernal Falls is seen in the background, where the water freefalls 317 feet (97 meters). Late spring to early summer is typically the peak season for the waterfalls in Yosemite as the warming temperatures begin to melt the winter snow pack. 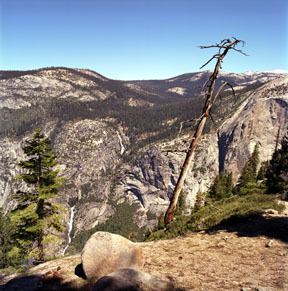 Looking north from the John Muir Trail, the much less photographed back side of Half Dome is seen on the left of the image. The steep knob in the middle is Liberty Cap and Nevada Falls is on the right. From nearly the same spot as above, just one year later, the dramatic affect of different lighting due to the weather is demonstrated. 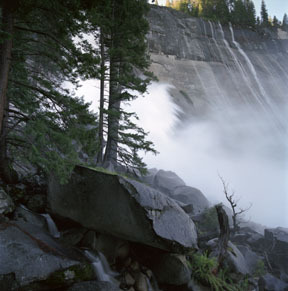 In the sunlight, the mist of Nevada Falls forms a dancing rainbow in the late afternoon. 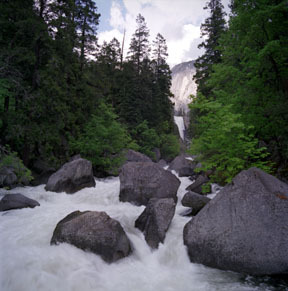 Near the base of Nevada Falls on this exceptionally high runoff period in 2003, the water chaotically tumbles past a seldom silent forest. Looking back toward the south from the switchbacks of the Half Dome Trail adjacent to Nevada Falls, the cascading Merced River is nearly deafening. There is also evidence of recent rock fall activity here, where the lighter, fresh granitic surfaces are seen in the middle left portion of the image. 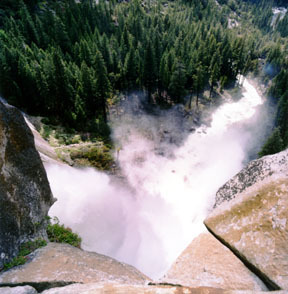 At a distance of about 3.5 miles (5.6 Km) from the trailhead (Half Dome/Mist Trail), this is a view over the side of an overlook on top of Nevada Falls. The Merced River drops 594 feet (181 meters), crashing onto an irregular surface that splays the mist in two separate directions. After a long gradual climb through a thinning forest, the trail opens up to this wide view of Yosemite Valley. Snow Creek Falls can be seen on the north side of the valley. The first glimpse of the cables is from this spot as well. Nearing the foot of the "hump" on the east side of Half Dome, the final legs of the journey come into view. The lower and left portions of the upper dome are obscured by the hump. In this close-up, the switchbacks on the Hump Ascent, along with the more distant cables section, are seen together. 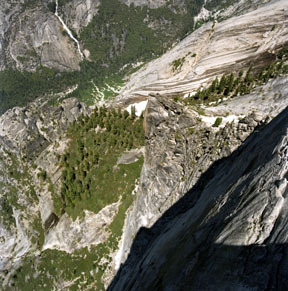 The famous cables section of the Half Dome Trail rises along the steep east side of the dome. Hikers that are not too fearful of the heights climb the 900-foot (275-meter) cables at an average angle of 44o! The reward for making this final ascent is an unparalleled view of Yosemite. The original cables, funded by the Sierra Club in 1919, were replaced in 1934 by the Civilian Conservation Corps. Metal poles keep the cables raised from the slope from spring to autumn. Here is a close-up of the cables. This is the view looking northeast from the 8,842 foot (2,720 meter) summit of Half Dome. 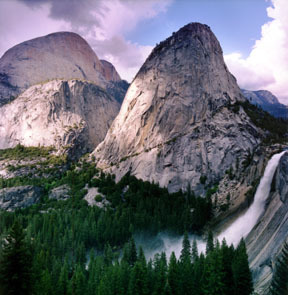 Tenaya Canyon is the main canyon feeding into Yosemite Valley. This was taken from near the "Diving Board" (next image). 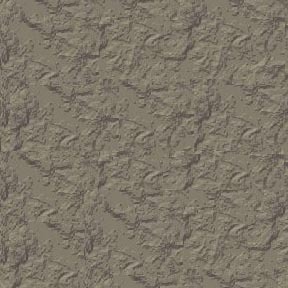 In the vertical wall, you can see the curved exfoliation joints, which roughly mimic the dome surface. 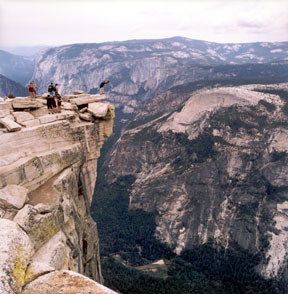 The Diving Board is a famous overhang at the summit. Looking west across Yosemite Valley, which is about 4,700 feet (1,430 meters) below, is North Dome (center right) and El Capitan (upper left, above the people). 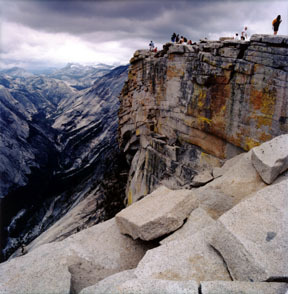 Here is a 360-Degree Panorama from the top of Half Dome taken at the end of May 2003 (242 Kb). Finally, the ultimate view from the top, looking straight down from below the diving board. Not a position for those weary of heights. The valley floor is the dark green swath in the upper left corner, and that's the base of Snow Creek Falls coming down from the north side of the valley. Everything below, and to the right of the valley floor is the face of Half Dome.